The amorphous Occupy movement had tremendous success coining the term “the 1 percent.” Many of them tagged “one-percenters” as the privileged few who supposedly escape all damages of the Great Recession at the expense of the 99 percent. Our “3 percent” calls out the small number of union workers whose cozy relationship with government insulates their wages, deluxe benefits and bulletproof job security from the economic world of the 97 percent. We see little difference between Occupy’s original focus and the current union power play — both represent the noxious effect of big money and big government in bed together at the expense of everybody else. The POJ campaign wants us to believe that government workers, representing the middle class, are being singled out for assault by the fiscal reforms begun last year by the Legislature and governor. For instance, many unionized government employees now have to pay 20 percent of their health insurance premiums (just like the 97 percent). Lawmakers closed about $1 billion of the $5.7 billion gap between government employee benefits and private-sector averages last year. We hope they are only getting started. Protect Our Jobs argues that, unless we pass their amendment, the entire middle class (not just unionized government workers) will be worse off. But the amendment does nothing for the middle class as a whole except putting them on the hook for ever-more-expensive unionized government workers. POJ would not affect union workers at private firms. Under the amendment, union contracts in government and schools would actually supersede the Legislature’s authority. The language explicitly states that no past or future law could affect anything in those contracts (except laws related to strikes). POJ would also probably ban a right-to-work law. Such a radical plan makes it clear the unions are going for broke. They’re not just trying to undo last year’s reforms. They’re trying to make every collective bargaining session a mini-constitutional convention, held in secret. My first chance to use “the 3 percent” was last month at a debate sponsored by the Detroit Regional Chamber on Mackinac Island (where I mistakenly said “two” instead of “three”). I was told I’d be going up against UAW’s Bob King, who keynoted the Chamber’s conference last year. But Mr. King decided not to debate me and sent a substitute. I’ve asked him to reschedule before the November election. 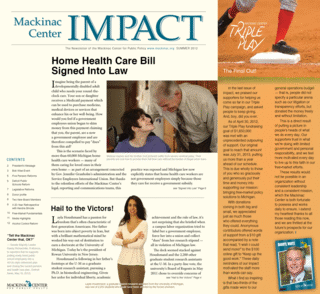 Mackinac Center Triple Play: The Final Out!